The anatomy of the Hummingbird is very fascinating. Even though they are extremely small creatures you don’t want to count them out. They have some amazing features that have made them a phenomenal type of bird species to study up close and personal. 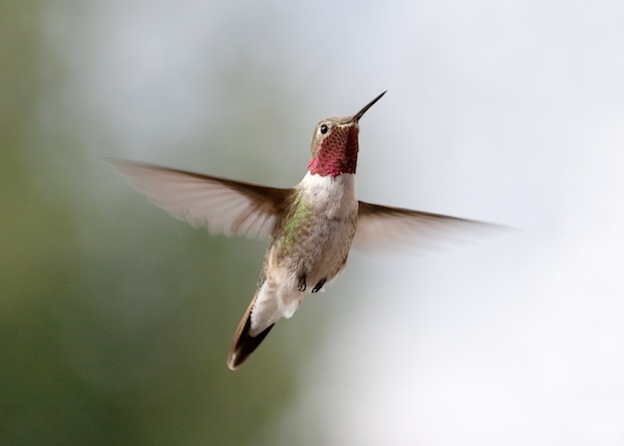 The Hummingbird has a backbone and it is believed to be the smallest animal in the world with one. The bill on this type of bird is very long and it is also tapered. They have to be able to feed out of the long tube like design due to the type of diet that they have (pollen, nectar, tree sap, and insects). They have a tongue with groves that helps them to consume their food items. They use the colors of their bodies to help them blend in. This is why at times you will see Hummingbirds displaying those amazing colors. At other times though they are hiding them. They often try to blend into their surroundings as a means of protection. They are small and they don’t have any defenses to protect them from predators so they have to remain undetected if they are going to survive. One of the unique structures for the Hummingbird is the design of the wings. They are able to move them in a circle which is different from other types of birds. This feature allows them to fly up, down, backwards, and even upside down. They are even able to just stay hovering in mid air without getting tired out. These wings make humming sound as their wings are moving which is where that name for them derives from. They can also move their wings from 60 to 80 times per second so you will see them moving very quickly. Try to count how many times if you can but chances are they move the wings so fast that you aren’t going to be able to count all of them. They move very quickly too which allows them to often get out of the way of danger and for migration. They are able to fly at a speed of about 20 to 30 miles per hour. However, during mating season they often do diving and that has been clocked at a speed of up to 60 miles per hour. This very small bird is also able to do things to help it survive in difficult times. When there is a lack of food or shelter these birds are able to slow down their metabolism. During that hibernation period their heart rate is about 1/15 of the normal rate in order for them to have every chance to thrive. Normally the heart is going to beat about 1,260 times per minute for a Hummingbird! Another interesting fact is that the Hummingbird naturally has the highest metabolic rate of all animals on Earth. Experts believe that the Hummingbird is a highly adaptable and intelligent bird. The size of the brain is about 4.5% of its body which makes it the largest brain of all birds in comparison to their overall size. The one part of the body of a Hummingbird that is weak is their feet. You will notice that they don’t prance around on them often like other species of birds. They prefer to simply flutter around to take the stress off their feet. When they are on the feet it is going to be to perch. They can’t move fast on their feet either because they are often unsturdy and unbalanced. There is some vocalization offered by the Hummingbird. They aren’t able to sing true songs like many other types of birds. Their vocalizations though are various types of chirps that we don’t have all the meanings for yet.